I don't think I'd buy this, but I've never seen one before, so I thought I'd do a little post about it. 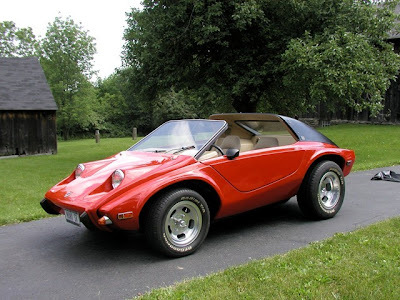 The Manx SR was a product of the B.F. Meyers Company, the same company that produced the famous Meyers Manx dunebuggy kit. "The next product of the company was the Manx SR (Street Roadster). This car was an attempt to short circuit the Manx copycats. Penned by Stewart Reed, a student fresh out of Art Center College of Design, it was intended for the street only and possessed a sleek aerodynamic shape that is still contemporary today. It was built to fit on the same shortened VW floorpan as the original Manx to keep the great handling characteristics. The car had thirteen fiberglass and many metal pieces making it much more of a challenge for the garage-type mechanic to complete." It's interesting looking. I find it kind of good looking from the side with the doors closed (I'm not a big fan of scissor doors unless they're on a Lamborghini. Even then I find them kind of hokey, but I guess now they're sort of a Lamborghini trademark). The rear looks "dune buggyish" and the front slightly unfinished, but all-in-all it's a lot better looking than most of the other VW bodykits available in the 60s and 70s. The interior actually looks quite good for a kit car. As I wrote in the first sentence, I'm pretty certain I would never buy one of these, I'm not especially fond of kit cars, but if you're looking for a unique looking vehicle with extremely low maintenance costs, this car would certainly fit the bill. Click here to see Manx Club website. Click here to see the ManxSR website. It looks like a dune buggy with a targa top. I'd take it over a Bradley GT though!